Why aren’t all the Ingredients listed on the Labels? Juice Plus+ is whole food-based nutrition, with a Nutrition Facts label, not a supplement label. It is made from whole, fresh fruits and vegetables, and contains all of the vitamins, minerals and other micronutrients present in the original produce. There are literally thousands of different phytonutrients in a single orange! This is in contrast to vitamin supplements that contain only a few vitamins in fragmented, isolated, and unnatural ratios. Nowhere in nature will one find a food that has the vitamin content of a vitamin pill. 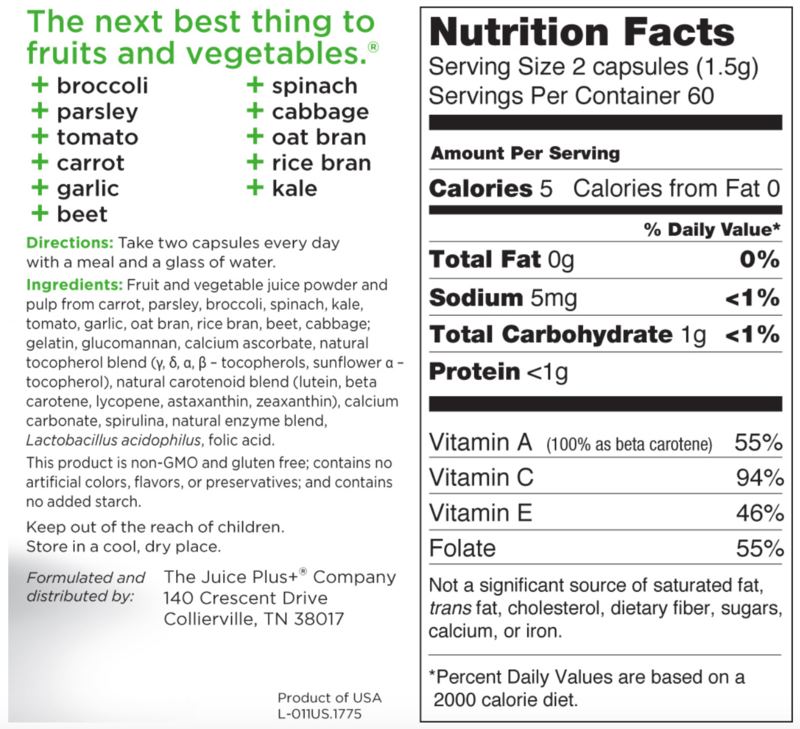 The bioavailability and synergistic effect found in fruits and vegetables is missing in vitamin pills. Therefore, such a comparison would be meaningless, and impossible. If there is a medical reason that someone needs to know how much of any vitamin or mineral is in Juice Plus+ we can request that information. The amount of acidophilus in Juice Plus+ is small, so many of us take a probiotic as well. This article on ‘servings’ may also help.